Explanation: If you could only see gamma-rays, photons with up to a billion or more times the energy of visible light, the Moon would be brighter than the Sun! That startling notion underlies this novel image of the Moon, based on data collected by the Fermi Gamma-ray Space Telescope's Large Area Telescope (LAT) instrument during its first seven years of operation (2008-2015). 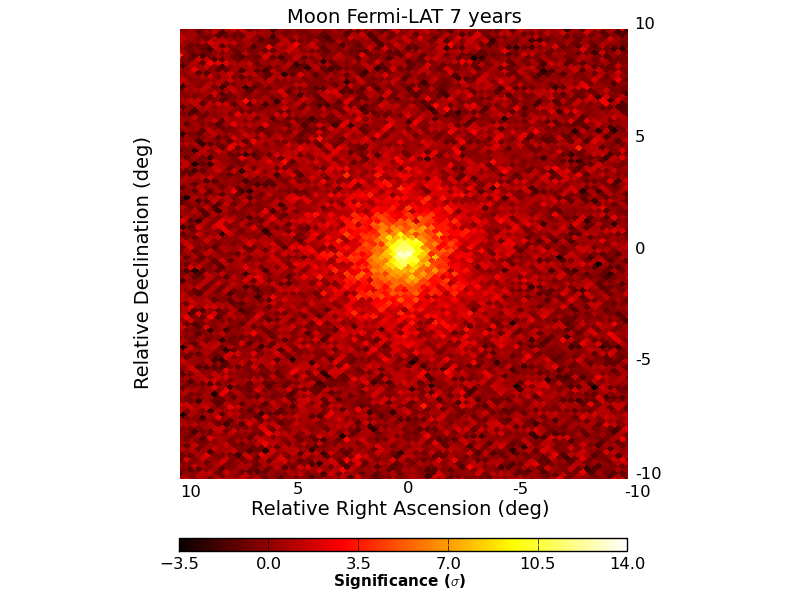 Fermi's gamma-ray vision doesn't distinguish details on the lunar surface, but a gamma-ray glow consistent with the Moon's size and position is clearly found at the centre of the false colour map. The brightest pixels correspond to the most significant detections of lunar gamma-rays. Why is the gamma-ray Moon so bright? High-energy charged particles streaming through the Solar System known as cosmic rays constantly bombard the lunar surface, unprotected by a magnetic field, generating the gamma-ray glow. Because the cosmic rays come from all sides, the gamma-ray Moon is always full and does not go through phases. The first gamma-ray image of the Moon was captured by the EGRET instrument onboard the Compton Gamma-ray Observatory, launched 25 years ago.